Idris Muhammad - Black Rhythm Revolution! 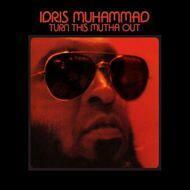 Idris Muhammad recorded this classic Jazz-Funk album 'Turn This Mutha Out' in 1977 for the Kudu label. Some great session musicians accompanied him and the album has that David Matthews signature Disco-Jazz-Funk sound. It was well received in the UK most notably for the opening track 'Could Heaven Ever Be Like This', an undisputed classic. Idris and Wilbur Bascomb on bass create the perfect bedrock for Mike Brecker on Tenor Sax, Hiram Bullock on Guitar and Cliff Carter on Synthesizer to solo above, topped by Frank Floyd's vocals. It has been sampled at least seventeen times, most notably by Jamiroquai and Drake.